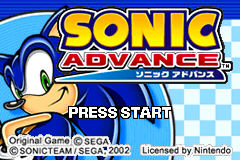 Sonic Advance (ソニック アドバンス) is a 2D Sonic the Hedgehog platform game released for the Game Boy Advance in late 2001. It was the first Sonic game to be released for the system, and along with Sonic Adventure 2: Battle (which was released in Japan on the same day), stands as the first Sonic game to be released on a Nintendo console, systems which traditionally rivaled those built by Sega. The evil scientist, Dr. Eggman, has hatched another dastardly plot. He plans to build a Dr. Eggman Empire by turning all the animals into robots. "If I gather all 7 Chaos Emeralds, I'll gain unimaginable power!" You can't just watch your comrades become tools of Dr. Eggman! Command Sonic as he dashes into action along with his pals, Amy, Knuckles, and Tails, to stop the evil Dr. Eggman! The Story begins as Sonic goes to search for Eggman around the South Island, by collecting Chaos Emeralds. Sonic arrives in Angel Island and he sees a robotic lookalike of Knuckles named Mecha Knuckles, and Eggman built the Egg Rocket which will go in outer space, so Sonic goes in and finds Eggman. Later he finds Eggman and chases him outside and defeats him. Bad Ending: After Sonic defeats Eggman, Sonic doesn't have enough chaos emeralds. He falls down to Earth and is caught by Tails in his Tornado. Good Ending: After Sonic defeats Eggman, he collects all the chaos emeralds and he turns into Super Sonic and chases Eggman onto the moon for his first time. After Super Sonic defeats Eggman and flies off the moon, Tails, Knuckles, and Amy wondered what happened to Sonic, so Tails goes to search for Sonic a few days later. He finds Super Sonic who came from the moon, as Tails waves to him. Sonic Advance features four playable characters; Sonic the Hedgehog, Miles "Tails" Prower, Knuckles the Echidna, and, for the first time as a playable character in a classic-style 2D Sonic game, Amy Rose. Sonic can have Tails follow him, Sonic 2-style, by entering a special code at the character select screen. All characters have separate save-games which record their individual progress. The player must play through 6 normal zones, followed by the X-Zone and The Moon Zone if certain conditions are met. Each of the normal zones contains two acts. Act 1 is completed by passing a signpost and Act 2 is completed by defeating one of Dr. Eggman's machines and opening the capsule that subsequently falls from the sky, releasing the captive animals. Sonic Advance was the last game in the Sonic series until Sonic 4 to use end-level signposts and capsules and Sonic's leg spin animation, and the first 2-D Sonic game that allows your character to grind on rails. The special stages are accessible from Special Springs, which are placed near the top in certain acts. Each normal zone contains one Special Spring, except for Ice Mountain Zone which contains two: one in each act. Chaos Emeralds can be collected if one passes the stage. The chaos emeralds are "shared" between characters. Once the player has collected all the Emeralds and completed the X-Zone with all four characters, they can access the Moon Zone by completing the X-Zone again with Sonic. This is one of several games to include the Tiny Chao Garden minigame. It is unlocked by default in this game. Controls are similar to previous 2D Sonic installments, and platform games in general. For all four characters, the button makes them jump. Sonic, Tails, and Knuckles all simultaneously spin attack when jumping as in previous games, however Amy does not, making her significantly more vulnerable in a number of circumstances in the game, effectively making her the most difficult to play as. While stationary, hold to look above and to look below. Sonic, Tails, and Knuckles can spin dash by holding and pressing , another classic feature, and can roll if running and pressing . Amy's behavior when these buttons are pressed is different, and is considered a special ability. Each character has their own unique abilities, which influence the game's overall difficulty. Each character's abilities are modeled after their special moves in Sonic Adventure. Sonic is the fastest character overall, Tails can fly and swim, Knuckles can glide and climb walls and Amy has her hammer. Each character's strengths and weaknesses particularly come into play when fighting bosses or trying to find access to the special stages. All the characters can perform an attack by pressing the button. These moves are most often less effective than a spin jump or a spin dash due to their short range. One of the characters can make combo attacks by pressing the button repeatedly. These and other special moves are explained below. Double Spin Attack (also known as the W Kaiten Attack or Insta-Shield): Press after jumping and a flash shaped like lightning will cover Sonic for a split second, increasing his attack range and speed. Jump Dash: Press or twice in rapid succession after jumping and Sonic will dash in midair, increasing his speed. Sonic is vulnerable in this state. Somersault: Press twice in rapid succession. With the first tap, Sonic rolls into a ball less tight than his usual spin attack. This only lasts a moment. Press again while he is in this rolling state and Sonic will perform a somersault, which can damage enemies in front of him. Sonic does a couple of somersaults, does a flip, then slides along the ground and stops. Skid Attack: Press during a Somersault and Sonic will flip forward and skid along the ground for a moment, damaging enemies in his path. Backflip: Press during a Somersault and Sonic will jump into the air backwards in a light spin. Sonic is vulnerable in this state. Rushing Attack (Super Sonic only): Press and Super Sonic will speed up and attack in a blaze of light. Fly: Press after jumping and Tails will begin fly. He will gain height by tapping again repeatedly, using the D-pad to control what direction Tails is going. He will not stop flying until he lands on something. Tails can damage enemies while in midair if he hits them with his tails. Tails can fly for 8 seconds. When underwater, this move will cause Tails to Swim, which is identical to flight except he cannot damage enemies. Like flying, Tails can only swim for 8 seconds, and can only stop by landing on something. Tail Attack: Press on the ground or in midair, while not flying or swimming, and Tails whips his tails around, damaging enemies immediately in front of him. Glide: Press and hold after jumping and Knuckles will glide sideways while slowly losing height. Press or and he will change his direction accordingly. Enemies in his path will take damage on contact with his fists. Release and Knuckles will fall, being vulnerable until he lands on something. When underwater, Knuckles will Swim, which is identical to gliding except he cannot damage enemies. Knuckles cannot gain height like Tails and he loses altitude at the same rate as gliding. Climb: If Knuckles glides or swims into a wall, he will cling to it. Press or and he will climb or descend it. Press and he will jump off. When he gets to the edge of a ledge, Knuckles will pull himself up onto it. Float: If Knuckles lands in a body of water, he will rise to the surface and float, regardless of how deep he initially goes. Press or and he will change his direction accordingly. Press and Knuckles will sink. Press and he will jump. Punch Attack: Press on the ground and Knuckles will let go a right cross, damaging enemies in front of him. Press again and he will punch a second time, but with his left hand. Uppercut: Press quickly after his second punch and Knuckles will perform an uppercut, damaging nearby enemies. Giant Steps: Press + while on the ground and Amy will take a giant step forward as opposed to a spin dash. This can be repeated so long as there is room. This move is good for getting up steep slopes. Head Slide Attack: Press during a Giant Step and Amy will slide forward, damaging enemies in her path. Hammer Jump: Press + while on the ground and Amy will smash her hammer into it, launching her into the air. Hammer Whirl: Press + in midair and Amy will swirl down toward the ground. If an enemy is hit, she will bounce up. Hammer Attack: Press and Amy will swing her hammer, damaging enemies immediately in front of her. If on the ground, press again quickly and she will swing it a second time, with farther reach. High Jump: Press such that the hammer hits a spring and Amy will be launched to great heights. NOTE 1: This game's Sound Test does not feature corresponding titles. Titles are made in relation to the next game in the series, which features such a Sound Test. NOTE 2: There are additional entries beyond the regular maximum amount (42) that include unlisted music (especially from the multiplayer modes), empty tracks, sound effects and duplicates. The maximum range is 199; 200 and up crashes the game. 1,210,000 Game Boy Advance US The Magic Box - US Platinum Videogame Chart These sales numbers makes Sonic Advance the only handheld Sonic game confirmed to have sold over one million units in one region. Some of the game's music is remixed from previous Mega Drive games. The remixed music includes the Options (Sonic 1's Scrap Brain Zone), Player Data (Sonic 1's Star Light Zone), 2P select (Sonic 2's 2P Emerald Hill Zone), invincibility (Sonic 1's Invincibility), and the first two bosses in the X-Zone (Sonic 1 and Sonic 2's boss musics). There is a mobile port created by Gameloft where you can only play as Sonic the Hedgehog and 3-4 Zones, depending on your device. This page was last edited on 23 March 2019, at 11:37.